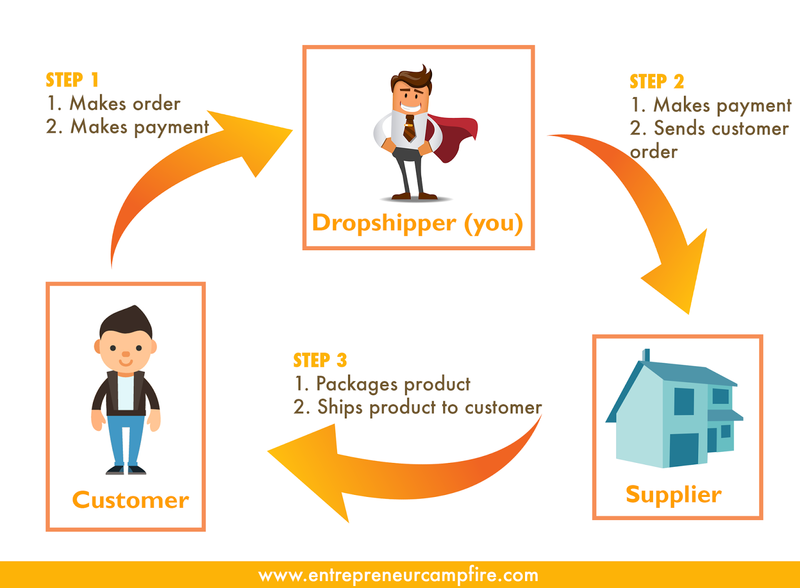 Dropshipping is a concept related to e-commerce. It’s a method in which the online store doesn’t produce or stock the product it sells. Instead, the store first sells the product then purchases it from a third party for a lower price and gets it shipped directly to the customer’s address. 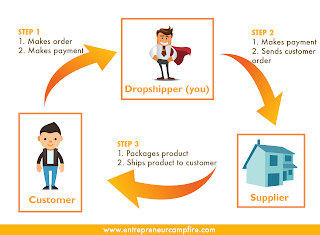 Dropshipping is an excellent business model because you just need to setup an online store, make sales and earn profits. You don’t need to worry about stock, inventory, packing, shipping or handling. It’s a great business model for someone who has very little money to invest because you don’t have to buy a product unless you’ve already made a sale and have been paid by the customer. So, basically in this business model you are using customer’s money for purchasing a product and making the profit without investing your own money. 1. Ability to deal with your clients and suppliers in a confident way. You should be able to answer their queries, solve problems and instruct them correctly. 3. Ability to spot trends, opportunities and adapt quickly. 5. Up to date knowledge of the industry. The hassle free way to get started is by signing up on Shopify.com. Shopify is a website which provides you all the technical things that you’ll ever need to setup your online store. You’ll get hosting, domain name, design, themes, payment gateways and almost everything at one place. Shopify makes online store setup so easy that anyone without much of technical knowledge can do it. It’s great a great choice if you want to focus and spend more time on your business growing activities rather than technical setup and maintenance. Shopify is not just like any website generator or CMS like WordPress. It’s a complete e-commerce platform with more than 70k people using it for selling products online. 1. Decide what you are going to sell - Before you can start setting up your online store on Shopify make a list of things that you want to sell. You can sell anything from wristwatches to t-shirts, necklaces, accessories and so on. If you still can’t decide what to sell then try to make a list of things you like or which interest you the most, this will give you a heads up. Does the product you are intending to sell have demand in the market? How much price are people willing to pay? Where are people visiting to buy these products? On which social media channel you can find your best potential customers? What is the age group of your potential customers? The best way to find the answers to above questions is to visit top e-commerce stores such as Amazon.com find which product designs are selling the best, read the customer reviews to get more insight into customers expectations. You can also visit product forums, join social media groups, popular blogs to collect more data about your potential customers. This data will help you to select the right products that will appeal your target audience and thus fetch you more sales and profits. For example, if you plan to sell wristwatches visit Amazon.com and check out best-selling wristwatches note down their price range, observe their designs, read customer reviews and note down important points. Find out other similar e-commerce sites like Amazon and repeat the above method. After that move on to watch forums, fashion blogs to collect more data about your potential customers. 3. Find the suppliers - Once you’ve finalized the products you want to sell, you can visit sites like Everbuying.net or Alibaba.com to find the suppliers who can provide you the products. Shortlist some good suppliers, discuss your marketing plan with them and see if they are the right fit for you and can deliver agreed products within the time limits. 4. Set your store on Shopify - Once you’ve complete the first 3 steps it’s the time to setup your online store. Do to this, register on Shopify.com, verify your email and start store creation process. Here you’ll need to choose your custom domain name, theme, product category and finally, add products. While adding products you can use the images and description used by your preferred supplier from Everbuying.net or Alibaba.com. 5. Pricing strategy - Your pricing strategy is going to define how much money you are going to make. Use the data you collected during the research step to decide your product’s pricing. For example, if you’ve decided to sell wristwatches and they cost you $17 per piece on Everbuying, and your research data is suggesting you to sell it for maximum $30, then you can sell it for $27 and make $10 profit on every sale. 6. Promote your product links - Once you’ve added products on your Shopify store you can start promoting them wherever you want. Social media is the best place beginning your promotion campaign. You can also offer discount codes to attract more customers to your store. 7. Orders and shipping - Once anyone places an order use that money to place the order from your supplier on Everbuying or Alibaba and provide him your customer’s shipping address. Your supplier will himself make the arrangement for packing and shipping. You don’t need to worry about anything. The more targeted people visit you store and make the purchase, the more money you make.